D A W N A C K R O Y D: Author Visit Coming Up! They say the early bird gets the worm. I am the epitome of the early bird. Sometimes working late gets one the goods too! I got an email after school today from the people at Wordfest. 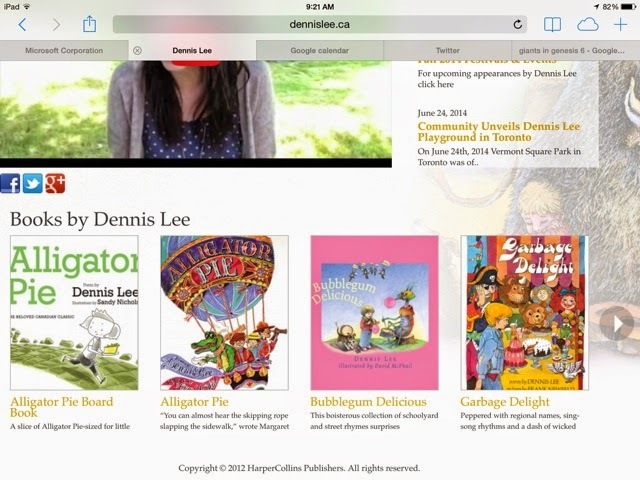 It seems that one of the authors, Dennis Lee, must have had some cancellations as they sent out an email saying he had some openings for school visits. I emailed my grade level team to see if they would be interested and I emailed my admin team to see if it would even be possible to have Dennis Lee in. We went back and forth and finally decided to book it!! I am so excited to have Dennis Lee visit our school!! Now we have some work to do to get ready!